It took him four years longer than he had hoped, but Nathan Adrian will swim in the 50 freestyle at the Olympics next month. Adrian, who finished third in the sprint event at the 2012 trials, won the event on Saturday evening at the U.S. Olympic Swimming trials in 21.51 seconds to hold off Anthony Ervin at 21.52 as both will go to Rio in that event. Check out this video of Nathan talking to the media in the mix zone, right after his victory. Bremerton’s Nathan Adrian will swim in the finals of the 50 freestyle on Friday after getting the second-fastest qualifying time from Wednesday’s semifinals. Nathan touched the wall in 21.60 seconds, as Anthony Ervin had the fastest time in 21.55 out of the two semifinal heats. The final will be held Saturday night. Nathan missed out on the event in London after finishing third at trials. He’s already secured his first individual swim in the 100 free after winning that event on Thursday. It’s almost a certainty that Nathan will swim in both relays as well. 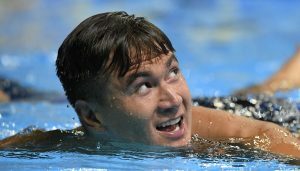 Nathan Adrian came back from a late night to win his heat in the 50 meter freestyle Friday morning. After qualifying for his third Olympics Thursday night, winning the 100 free and giving himself a shot at defending his 2012 gold medal, Adrian touched the wall in 21.96 — good enough for fourth place. He is the American record holder in the event in 21.37. The semifinals begin at 5 p.m. local and can be seen at nbcolympics.com or on tape delay at NBC at 8 p.m.